William Henry Shaw “Scotty” MacDonough, age 90, of Panama, IL passed away Sunday, December 2, 2018 at his home. A memorial service will be held Saturday, December 8, 2018 at Redeemer Baptist Church in Panama, IL. Memorial contributions are suggested to Shriners Hospitals for Children. Burial will be in Jefferson Barracks National Cemetery at a later date. Scotty was born April 23, 1928 in Au Sable Forks, New York to Frederick Raymond and Patience Elizabeth (Shaw) MacDonough . He married Wanda Lou Stephens on September 25, 1954. He is survived by his wife, Wanda; daughter, Karen Elizabeth (Ricky) Williams of Sorento, IL and one granddaughter, Amanda Gochanour of Mississippi. He was preceded in death by his parents; a sister, Eunice Copans; and two grandsons, William Thomas and James Allen Gochanhour. He grew up in Au Sable Forks, New York attending and graduating from Au Sable High School. After high school, he joined the United States Army, from which he retired, reaching the rank of E-7. He served 6 months in the artic and 39 months in Japan and Korea. He moved to Granite City where he met his wife and they married in the First Baptist Church. Fifteen months later their daughter, Karen, was born. He worked for and retired from the Manufacturer’s Railroad, as a switchman, which was owned by Anheuser-Busch and serviced the riverfront businesses. 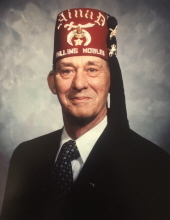 He belonged to the Granite City Masons, Lodge 877; the Joppa Shrine Center in Gulfport, Mississippi; and was a member of the Bond County Shrine Club. In 2002 he was a Provost Marshall for Jackson and Harrison counties in Mississippi. Scotty enjoyed fishing, watching NASCAR on television, keeping up with the news, and buying lotto tickets every week – although he never won. To send flowers or a remembrance gift to the family of William Henry Shaw "Scotty" MacDonough, please visit our Tribute Store. "Email Address" would like to share the life celebration of William Henry Shaw "Scotty" MacDonough. Click on the "link" to go to share a favorite memory or leave a condolence message for the family.